Special tool - This fantastic Laguiole Sommelier corkscrew is equipped with a conical spiral, which accomplishes the opening of oldest bottles with the necessary tenderness, without damaging the cork. This is certified by the most well known oenologists in various tests. It's most ergonomic and beautiful design, guarantees a comfortable handling. The integrated cap cutter prepares bottles to an optimum. - An exceptional hand crafted genuine Laguiole product from the French cutlery manufacturer Claude Dozorme at Thiers purfled with the bee as the typical Laguiole design element. Forged from top quality steel and shiny polished, for highest comfort with exceptional surface feel and visual appearance. - A pleasure for all senses. 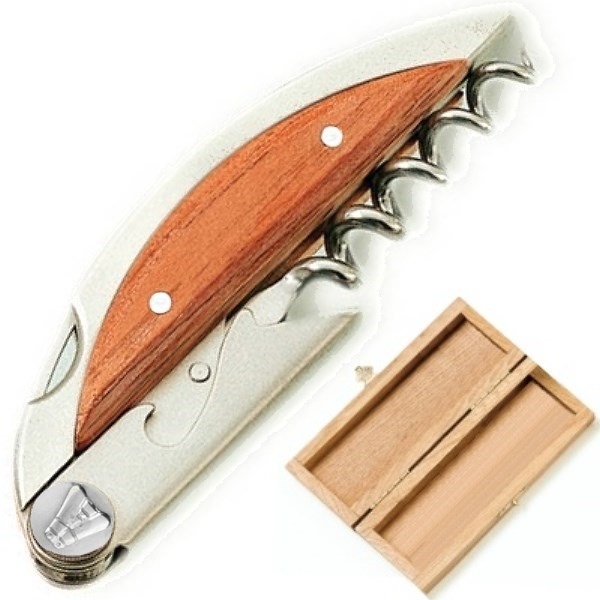 - Laguiole Sommelier Corkscrew in box, with integrated cap cutter. - Laguiole Sommelier Haute Cuisine, designer corkscrew waiter's knife in oak wood box, with conical spiral, l 11 cm, exotic wood handle.